Bring Me Flowers by D.K. Hood is the second book in the Detectives Kane and Alton police procedural series. This book picks up six months after the end of the first book of the series and starts a whole new case for the detectives so it could be read as a standalone although there will be some character building left out that was learned from starting at the beginning. This series is set in he small town of Black Rock Falls where Jenna Alton had been residing as the current head of police but was also a member of witness protection. In the first book she got a new hot shot detective in David Kane who also had his own history that had brought him to the sleepy little town. Of course the one thing we as readers know is that their little town would not remain sleepy for long. Now picking up six months after their first big case together was solved the detectives get a phone call that a body had been found that may have been the victim of a bear attack. 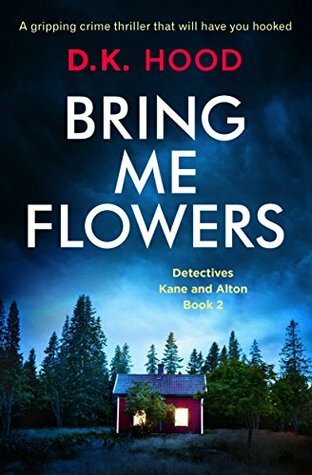 Of course in Kane and Alton’s world it quickly becomes know that what they have on their hands is the work of a possible serial killer. As much as I enjoyed the first book of this series I think I liked book two even more. There has been another player added in the small town crime solving until bringing in a forensic expert to add to the mix and Jenna and David both were back at what they do best solving crimes. You can see the dynamic growing between the two leads which may some day become romantic but is slow moving for now as everyone is getting to know one another in the town. The author did another great job building the story to throw in those red herrings and give plenty of suspects to keep readers on their toes with this one too. I will say though that this time I did manage to guess the correct suspect but I don’t think it was due to ease so I can see it being surprising to most. In the end I’d rate this second installment at 4.5 stars and will look forward to the next in the series. I’ve always had a wicked sense of humor, and was the kid who told the ghost stories around the campfire. I am lucky to have family all over the world and have spent many wonderful vacations in places from Paris France to Montana USA and Australia. I use the wonderful memories from these visits to enhance my stories. I know I like most of their books! Great review Carrie. I am glad to hear that you are enjoying this series. The detective team sure does sound interesting and I really like the small town setting. Might add this to my TBR.